It’s late August, and the heir to the title, Earl of Bentley, faces a dilemma. He must find, persuade, and marry a titled and moneyed English lady before October 30th or he will lose his estates, lands, and finances. So, Bentley, unlearned in the Rules of Love and the intricacies of women’s psyches confronts a ticking clock. He hires a matchmaker. Lady Camilla Merriweather, eldest daughter of a viscount, must use her considerable beauty to marry a rich, titled, Englishman to save her large family from the poverty and disgrace brought upon them by huge losses in the stock market. Due to a mix-up, Lady Camilla finds herself at a house party set in motion by the Earl’s matchmaker. Will a series of blunders and adventures lead to a happily-ever-after ending? 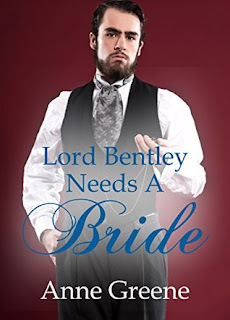 My thoughts: LORD BENTLEY NEEDS A BRIDE is the first book I've read by Ms. Greene (I think, I might've read the one published by Moody) and I greatly enjoyed it. Lord Bentley isn't quite sure how to navigate the world of women and it doesn't help matters that his own brother spreads rumors that Lord Bentley is actually the most despicable sort. Which is untrue but his brother wants the title and the wealth. That was the biggest issue I had with this novella. The writing is top-notch, it flows great, it kept my interest, but the romance was too rushed and a bit unrealistic to me. I did greatly enjoy it though. I quite unexpected received a copy of this book in the mail from someone, but not the author. All opinions are my own. I believe this would be a fun read from your review.